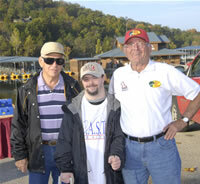 See the Table Rock Lake website for additional information. Primary recreational opportunities are listed below. Directions: From Springfield, MO. 40 miles south on US 65 to Branson, MO. Then take US 165 west approximately 7 miles to Table Rock Dam. Factoid: Winding through the valleys of the Ozark Mountains, from Branson, Missouri to Eureka Springs, Arkansas, Table Rock Lake is a paradise for boaters, scuba divers, campers and fishermen alike. Camping enthusiasts choose from 13 modern campgrounds located adjacent to the lake. Full-service marinas provide service and convenience to boaters. Resorts located adjacent to Table Rock Lake provide visitors with numerous water-related activities and five commercial boat cruises operate on Table Rock Lake seasonally.